Controlling Mosquitos Naturally | What's Green with Betsy?!? Along with the cookouts, volleyball games, hiking, camping and other glories of summer come mosquitoes and ticks. But pesticides or products containing DEET, are associated with a variety of health problems ranging from dizziness to seizures with children being particularly susceptible. There are several safer and effective alternatives. A garlic spray in your yard provides excellent control. Garlic has natural sulfur which repels insects, including mosquitoes, ticks, fleas and even black flies, yet does not harm humans, pets, bees, butterflies or plants. Mosquitoes are soft-bodied insects and garlic juice is toxic to them in increased concentrations. Mosquitoes are also extremely odor sensitive and garlic can repel them for up to a month or more, as long as they can still detect an odor. Farmers have been using garlic for generations. Organic based landscaping or pest control companies often offer a garlic spray or you can buy a product called Garlic Barrier and do it yourself. For small areas like patios or decks, certain aromatic plants keep mosquitoes away. Marigolds planted with pungent herbs like catnip (nearly 10 times more effective than DEET) and rosemary are effective and attractive in containers. 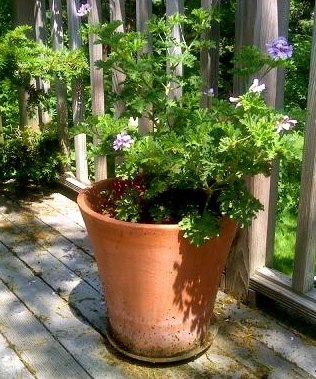 I planted a “mosquito plant”, really a wild scented geranium, which grows fast and seems to work. It was specifically grown to keep pests away. Citronella candles can be helpful, as well as all natural insect repellent incense sticks. Or you can burn a little sage or rosemary over coals to repel mosquitoes. Two important and effective cultural practices are: 1) Don’t keep standing or stagnate water around where mosquitoes can breed and 2) consider putting up a bat house. Mosquitoes are the primary food source for bats and some species eat up to 1000 of them an hour! For personal repellents sprayed directly onto your skin, soybean-oil-based products have been shown to provide protection for a period of time similar to a product with a low concentration of DEET (4.75%). Other ingredients usually include pure plant extracts like citronella, cedarwood, eucalyptus, geranium, lemongrass and peppermint, which are natural, effective and have a nice aroma. Buzz Away and Bite Blocker are good brands that are potent and long-lasting. You can find them at Whole Foods. In areas heavily infested with deer tick, a DEET product may be needed. Just spray directly onto your clothes, not your skin! For more information on deer ticks, click here. Ticks and mosquitos don’t have to ruin your summer! 17 responses to this post. I too am one of those sweet-tasting people mosquitos love. Yes, you do need cover up, but some of these all natural products made from essential oils do work, you just need to apply them more often. Thanks for commenting…..
Let me know how they work! Here’s to a happy mosquito-free summer! I didn’t take it as criticism. I’m glad you pointed out that one should cover up! Obvious, but I should have mentioned it. Thank you…. I love bat houses and I’m seeing them in our state parks here in Pennsylvania more and more. I cannot stress enough the importance of checking around the house for any standing water if you get a sudden infestation of mosquitoes. Great post as usual! Thanks. I agree, though with the mini-drought we are having, there certainly is no standing water. We need rain! I had no idea butterfly plants were mosquito repellants. Tomorrow I shall head to the garden center. Thank you for sharing. I’m not sure about butterfly plants, but marigolds, wild geraniums and several types of herbs for sure! Good luck…. Sounds good. I thought I read Butterfly Plants too :)). Maybe I was thinking about butterfly plants because I like them. Thanks for commenting. I hope they work for you. Please let me know! You have a nice weekend too…..